I love what Desi has put together and the opportunity to add value to her community. She's created an amazing online conference For Moms by Moms. We all struggle to figure out how to be the best moms we can and that is where The Mom Conference comes in. 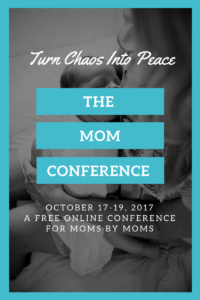 The Mom Conference is a totally FREE three-day online event. It runs October 17, 18 & 19th. Best of all, you can listen while you fold laundry, do the dishes, or during nap time. Attend the conference with over 75,000 moms around the world and come away armed with powerful new strategies on everything from sibling rivalry to meal planning to finding more joy in motherhood. Getting out of the cycle of yelling, nagging, and reminding to get your kids to listen. Managing sibling rivalry, when to step in or when to let your kids work it out. Setting up routines so you can have time for what’s most important to you. Keeping your kids safe online. Effectively managing depression and anxiety. Keeping up with a busy household; you’ll learn the best of the best mom hacks. Living a more intentional and joyful life and teach your children to do the same. To help you avoid procrastination (one of my biggest struggles), if you register RIGHT NOW, you’ll have access to the following FREE GIFT as soon as your registration has been completed! ~ A FREE Listening Guide for Dr. Laura Markham’s interview on sibling rivalry. Get a sneak peak on the key takeaways from her interview. I'm grateful to be able to help promote this amazing event and to be a part of The Mom Conference blog. I'm grateful for all the new tools and inspiration I will gain from joining in and listening to the amazing speakers October 17, 18 & 19. And I'm grateful it's all online so I can watch it from the comfort of Starbucks while my kids are at Open Connections :) I'd love to hear which speaker you're most looking forward to learning from? Please join the conversation in our Facebook Community. P.S. If you read all the way to the end and still haven't registered, do it HERE!